This bayou classic allows cats to get in touch with their southern senses. Our Turducken™ shredded recipe for cats is prepared with a delicious combination of deboned turkey, duck and chicken all cooked together in their wonderful juices which will make even your mouth water. It's time that all of our feline friends had a taste of this Cajun treat. 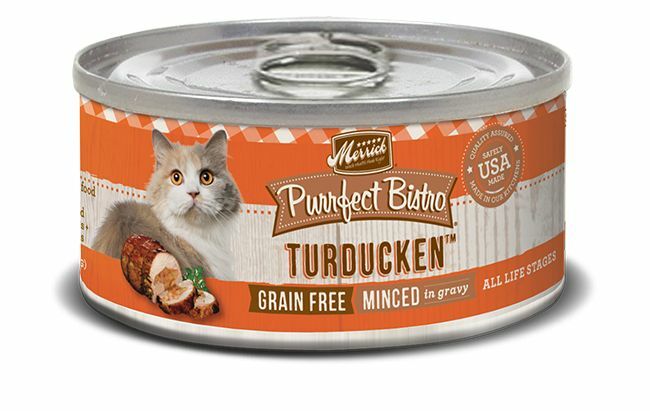 Purrfect Bistro Turducken™ Canned Cat Food contains no artificial colors, flavors or preservatives. Deboned Turkey, Chicken Broth, Deboned Duck, Chicken Liver, Peas, Dried Egg Product, Natural Flavor, Dried Potato, Sweet Potato, Carrots, Cranberries, Organic Alfalfa, Calcium Carbonate, Salt, Potassium Chloride, Carrageenan, Guar Gum, Powdered Cellulose, Sodium Phosphate, Salmon Oil, Minerals (Zinc Amino Acid Complex, Iron Amino Acid Complex, Manganese Amino Acid Complex, Copper Amino Acid Complex, Potassium Iodide, Cobalt Glucoheptonate, Sodium Selenite), Vitamins (Vitamin E Supplement, Vitamin B12 Supplement, d-Calcium Pantothenate, Vitamin A Supplement, Niacin, Vitamin D3 Supplement, Riboflavin Supplement, Pyridoxine Hydrochloride, Folic Acid, Biotin, Thiamine Mononitrate), Taurine, Choline Chloride, Thyme, Sage, Rosemary, Yucca Schidigera Extract.